The 2015 South West Quilters traditional quilt award was won at the Quilts UK Malvern Show by Gretchen Danckwardt. Pictured to the right is Gretchen’s winning quilt. Amongst my earliest memories is the fascination of stitch and colour contrasts that I could produce with embroidery. I used to make hanky and glasses cases and decorate tea trays with flowers, amazed that I could make something beautiful and useful with pieces of fabric and thread. My mother, who made clothes and soft furnishings for the family, died when I was eighteen, leaving behind a pile of scrap material. At about the same time, I became enthralled by old quilts which I saw in museums and exhibitions, and I wanted to know more about the makers, materials and inspirations for these wonderful works of art. I wanted to make one too, so I experimented with a hexagon template and made my first quilt when I was still a teenager. Instinctively, I knew that my future projects would be completely hand-sewn, English paper-pieced and use traditional techniques, but modernised with design and colour choices. I was hooked! Then life took over – relationships, career and children. A few years ago I resurrected my passion for patchwork, giving myself the task of using just 1.5cm hexagons, which I found the most satisfying shape to work with, both in the creation and final result, to produce as many different designs and feelings as I had time for. I decided that if I ever tired of this shape, I would go on to working with squares or diamonds. I am still working with small hexagons! My task was to make twelve quilts – one for every month – based around the theme of an English garden, as it changes throughout the year. As each quilt takes between six and nine months to make, I knew that this was not going to be a quick job. The project that won “Best Traditional Quilt” at Quilts UK in Malvern this year is Grandmother’s Flower Garden, which is the quilt for June, when the flowers are in full bloom. Most of the material used is from Mummy’s scrap box or school needlework projects, and when I look at it now, it takes me back to the childhood gardens in which I spent many happy hours. 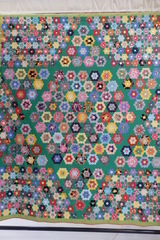 I wanted to use different sizes of “flowers”, held together by green borders, and to create an overall pattern that would be enhanced by looking at it from a distance, as all my quilts are designed to be hung on a wall, rather than on a bed. A star emerged as I was sewing – I don’t design the whole quilt before I start, but patterns emerge as I work. I have never had any interest in traditional quilting, so I thought I would hold the three layers together with buttons. With so many different floral prints in this particular quilt, I thought that using the same size of button throughout, would unify the piece in some way. Luckily, I managed to acquire a huge amount of buttons at a car boot sale a few years ago. Most of the other eleven quilts have buttons from the family button tins, which have been passed down through several generations of my family. You will by now realise that my mission is to give new life to unwanted materials, making them into something beautiful, and to preserve in some way our sewing heritage. Another tradition in my work is to make one deliberate error to remind us that nothing is perfect on earth. Trying to find the patch in the wrong place makes people look really carefully at the quilt. There are of course many non-deliberate errors – I’m not interested in perfection or neatness. I hope people will stand in front of my quilts and go “WOW!”. I decided to enter a few competitions to get my work more widely known. The first was The Scottish Quilt Championships in September 2014, where my July quilt, “My Bejewelled, Scrappy Garden”, won a Judges Merit certificate. The second was the West Country Quilt Show in Bristol in November 2014, where my August quilt, “Sun, Sea and Sangria”, won Best Traditional Quilt. Quilts UK in Malvern was the third competition where again I won Best Traditional Quilt I also entered my Christmas quilt – “Follow the Pointing Star” into The National Quilt Championships at Sandown Park in June, but sadly no rosettes this time – you can’t win them all! 2016 will be an exciting year for me as ten of my quilts will be on exhibition with Grosvenor Shows, probably at Duxford, Exeter, Spalding and Sandown Park, do look out for them at a show next year.